I think it’s safe to say that onions are a relatively popular vegetable. Although, they tend to be more the co-star than than the lead actor in a meal. Apart from onion rings, when was the last time you saw an onion casserole, onion salad, or sautéed onions as a main or side dish in a restaurant? Not very likely! While that’s probably not going to change anytime soon, you may want to onions to play a more prominent role in your own kitchen. It might surprise you to know that onions (Allium cepa) have been the focus of dozens of scientific studies in recent years. In some parts of the world, onions have been used in traditional remedies. This historical precedent is most likely the basis for the modern evaluation of the onion’s medicinal potential. And, low and behold, many of these scientific trials have yielded provocative findings. Onions for Stronger Bones: The December 2015 edition of Food & Function reports that 100 mL/day (less than half of cup) of onion juice improves antioxidant status and bone mineral density (BMD) in post-menopausal women. Previous studies in animals and humans have found that daily onion consumption is associated with fewer hip fractures and stronger bones. 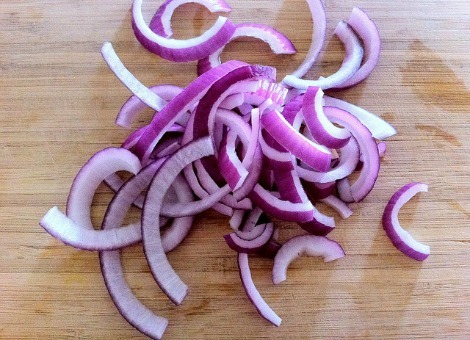 Onions for Cardiovascular Health: Garlic, another member of the Allium family, has long been considered a cardio-tonic. Of late, scientists have discovered that onions present similar health benefits. Different forms of onion improve various cardiovascular risk factors. One trial determined that 100 mL/day of onion juice decreased waist circumference, LDL and total cholesterol and LDL oxidation in patients with hypercholesterolemia aka high cholesterol. A separate experiment discovered that a novel, red wine extract of onion outperformed conventional red wine by lowering LDL cholesterol, LDL oxidation and inflammation. Lastly, an onion extract containing 51 mg of quercetin, has been shown to protect against negative changes in post-meal endothelial function – a measure of circulatory health. Onions vs. Diabetes: The anti-diabetic activity of onion was first reported in the medical literature some fifty years ago. A 2014 review in the journal Nutrition describes several components that may underlie the hypoglycemic effects of A. cepa. Among them, the authors list flavonoids, such as quercetin, and S-methylcysteine as likely candidates. Other experiments propose that onion impairs the activity of certain enzymes which are used to digest carbohydrates. In the case of diabetes, at least two studies indicate that raw onion is particularly effective in lowering blood sugar. Onion skin is generally thought of as scrap material. Much like a banana peel, it’s usually tossed in the compost or trash bin. Interestingly, the skin of onions is currently emerging as a potent natural medicine. It turns out that onion skin is an abundant reservoir of bioavailable quercetin – a powerful antioxidant. Isolated forms of quercetin are notorious for being poorly absorbed. However, onion skin extract is an exception to the rule. In practical terms, onion peel extract promotes wellness in diverse ways such as: a) protecting against oxidative stress and poor circulation in overweight adults; b) lowering the atherogenic index and blood pressure in high risk individuals; and c) improving cardiometabolic health markers in smokers. My suggestion for adding onion skin to your diet is as follows: Gently wash the skin and pat it dry (note: use only organic onion skin). Add it to broths, crock pot recipes and soups. Because of its texture, it’s probably best to blend it or strain it before eating. You can even add onion peel to homemade smoothies. The taste is surprisingly mild, but the health benefits may be quite profound. BACKGROUND/OBJECTIVES: The anti-obesity effect of quercetin-rich onion peel extract (OPE) was suggested in rats, but information from human studies is limited. This study aimed to investigate the effects of OPE on the body composition of overweight and obese subjects. SUBJECTS/METHODS: In this 12-week, randomized, double-blind, placebo-controlled study, parallel clinical trials were performed in overweight and obese Korean subjects. Randomly assigned subjects were instructed to take daily either the placebo (male, 6 and female, 30) or OPE capsules containing 100 mg of quercetin (male, 5 and female, 31). Body composition was measured by using bioimpedance and dual-energy X-ray absorptiometry (DXA). Resting energy expenditure (REE) and respiratory quotient (RQ) were evaluated by using indirect calorie measurement methods. Fasting blood levels of glucose, insulin, lipids, and leptin were determined. RESULTS: Quercetin-rich OPE supplementation significantly reduced the weight and percentage of body fat as measured by DXA (P = 0.02). These effects were not shown in the control group. Levels of blood glucose (P = 0.04) and leptin (P = 0.001 for placebo, P = 0.002 for OPE) decreased in both groups. Significant increases in REE and RQ were observed in both groups (P = 0.003 for placebo, P = 0.006 for OPE) and in the OPE group alone (P = 0.02), respectively. CONCLUSIONS: Quercetin-rich OPE supplementation changed the body composition of the overweight and obese subjects. This result suggests a beneficial role of the anti-obesity effect of OPE human subjects. Mol Nutr Food Res. 2015 Sep;59(9):1641-50. Relation of allium vegetables intake with head and neck cancers: evidence from the INHANCE consortium. SCOPE: Only a few studies analyzed the role of allium vegetables with reference to head and neck cancers (HNC), with mixed results. We investigated the potential favorable role of garlic and onion within the International Head and Neck Cancer Epidemiology (INHANCE) Consortium. METHODS AND RESULTS: We analyzed pooled individual-level data from eight case-control studies, including 4590 cases and 7082 controls. We estimated odds ratios (ORs) and 95% confidence intervals (CIs) for associations between garlic and onion intakes and HNC risk. Compared with no or low garlic use, the ORs of HNC were 0.95 (95% CI 0.71-1.27) for intermediate and 0.74 (95% CI 0.55-0.99) for high garlic use (p for trend = 0.02). The ORs of HNC for increasing categories of onion intake were 0.91 (95% CI 0.68-1.21) for >1 to ≤3 portions per week, and 0.83 (95% CI 0.60-1.13) for >3 portions per week (p for trend = 0.02), as compared to <1 portion per week. We found an inverse association between high onion intake and laryngeal cancer risk (OR = 0.69; 95% CI 0.54-0.88), but no significant association for other subsites. CONCLUSION: The results of this pooled-analysis support a possible moderate inverse association between garlic and onion intake and HNC risk. J Obstet Gynaecol Res. 2014 Apr;40(4):1067-76. Effects of raw red onion consumption on metabolic features in overweight or obese women with polycystic ovary syndrome: a randomized controlled clinical trial. AIM: We aimed to evaluate the effects of raw red onion consumption on metabolic features in overweight and obese women with polycystic ovary syndrome. MATERIAL AND METHODS: In this randomized controlled clinical trial, the patients (n=54) were randomly allocated to the intervention group as ‘high-onion’ (raw red onions: 2 × 40-50 g/day if overweight and 2 × 50-60 g/day if obese) or to the control group as ‘low-onion’ (raw red onions: 2 × 10-15 g/day) along with limited liliaceous vegetables for 8 weeks. Body mass index, dietary record, and metabolic parameters (fasting blood sugar, triglycerides, total cholesterol, low-density lipoprotein cholesterol, high-density lipoprotein cholesterol, and lipoprotein (a)) were evaluated in the follicular phase of the menstrual cycle at baseline and after 8 weeks. Hormonal variables (progesterone, prolactin, and 17-OH progesterone) were also measured at baseline. RESULTS: Onion significantly decreased the levels of total cholesterol within each group; however, these changes were stronger in the high-onion group (weighted mean differences [WMD]: -5.60 [95% confidence interval [CI]: -9.16, -2.03]; P=0.003) than in the low-onion group (WMD: -6.42 [95%CI: -11.97, -0.87]; P=0.025). Similarly, low-density lipoprotein cholesterol decreased significantly (WMD: -5.13 [95%CI: -9.46, -0.81); P=0.022) in the high-onion group, and (WMD: -2.90 [95%CI -5.57, -0.21]; P=0.035) in the low-onion group after treatment. The levels of fasting blood sugar, triglycerides, high-density lipoprotein cholesterol and lipoprotein (a) did not differ significantly after 8-week onion treatment. Adjustment for confounders did not make any significant changes in any of the parameters in post-treatment levels. CONCLUSION: Raw red onion consumption appears to be effective as a cholesterol-lowering food agent in women with polycystic ovary syndrome. However, further investigation is warranted. J Agric Food Chem. 2010 Jul 28;58(14):8426-9. Higher bioaccessibility of iron and zinc from food grains in the presence of garlic and onion. Bioavailability of micronutrients iron and zinc is particularly low from plant foods. Hence there is a need to evolve a food-based strategy to improve the same to combat widespread deficiencies of these minerals in a population dependent on plant foods. Dietary sulfur-containing amino acids have been reported to improve the mineral status of experimental animals. Our objective was to examine whether sulfur compound-rich Allium spices have a similar potential of beneficially modulating the mineral bioavailability. In this context, we examined the influence of exogenously added garlic and onion on the bioaccessibility of iron and zinc from food grains. Two representative cereals and pulses each were studied in both raw and cooked condition employing two levels of garlic (0.25 and 0.5 g/10 g of grain) and onion (1.5 and 3 g/10 g of grain). The enhancing effect of these two spices on iron bioaccessibility was generally evidenced in the case of both the cereals (9.4-65.9% increase) and pulses (9.9-73.3% increase) in both raw and cooked conditions. The two spices similarly enhanced the bioaccessibility of zinc from the food grains, the extent of increase in cereals ranging from 10.4% to 159.4% and in pulses from 9.8% to 49.8%. Thus, both garlic and onion were evidenced here to have a promoting influence on the bioaccessibility of iron and zinc from food grains. This novel information has the potential application in evolving a food-based strategy to improve the bioavailability of trace minerals and hence contributes to the human health benefit. Food Chem. 2016 Jun 15;201:315-9. Heated apple juice supplemented with onion has greatly improved nutritional quality and browning index. Although fruit juices are very popular, enzymatic browning occurs easily. Browning of fruit juice deteriorates nutrition value and product quality due to oxidation of polyphenol compounds. Therefore, development of natural food additives that reduce browning will be beneficial for improving quality of fruit juices. Onion has been reported to be a potent natural anti-browning agent. Here, we compared unheated and heated apple juices pre-supplemented with onion with respect to browning and nutritional quality. The unheated apple juice supplemented with onion showed reduced browning as well as increased total soluble solid, total phenol concentration, radical scavenging activities, and ferric reducing and copper chelating activities without any change in flavonoid concentration. On the other hand, heated juice supplemented with onion not only showed improved values for these parameters but also markedly increased flavonoid concentration. Thus, we conclude that application of heating and onion addition together may greatly improve quality of apple juice. Nutr Metab Cardiovasc Dis. 2015 Dec 19. BACKGROUND AND AIMS: Because pro-inflammatory stimulants of Toll-like receptor-2 and TLR4 (pathogen-associated molecular patterns, PAMPs), are abundant in some processed foods, we explored the effects of diets enriched or depleted in these molecules on markers of cardiometabolic risk in man. METHODS AND RESULTS: Adherence to a low PAMP diet for 7 days reduced LDL-cholesterol (-0.69 mM, P = 0.024) and abdominal circumference (-1.6 cm, P = 0.001) in 11 habitual consumers of high PAMP foodstuffs, and these markers, together with leukocyte counts (+14%, P = 0.017) increased significantly after 4 days consuming predominantly high PAMP foods. Change in LDL-cholesterol and leukocyte counts correlated well with change in frequency of intake of high PAMP foodstuffs per individual (r = 0.540, P = 0.0095 and r = 0.6551, P = 0.0009, respectively). In an independent group of 13 healthy men, leukocyte counts and expression of the activation marker CD11b on granulocytes and monocytes were significantly reduced after a fresh onion meal (P < 0.05), but these effects were reversed by a high PAMP equivalent meal. CONCLUSIONS: A low PAMP diet is associated with reduced levels of several cardiometabolic risk factors, while a high PAMP diet reverses these effects. These findings suggest a novel potential mechanistic explanation for the observed association between processed food consumption and risk of cardiometabolic diseases. Eur J Nutr. 2016 Feb 29. Acute intake of quercetin from onion skin extract does not influence postprandial blood pressure and endothelial function in overweight-to-obese adults with hypertension: a randomized, double-blind, placebo-controlled, crossover trial. PURPOSE: To determine whether postprandial metabolic and vascular responses induced by a high-fat and high-carbohydrate meal are attenuated by ingestion of the flavonol quercetin. METHODS: Twenty-two overweight-to-obese hypertensive patients participated in a randomized, double-blind, controlled, crossover meal study. They consumed a test meal (challenge) rich in energy (4754 kJ), fat (61.6 g), saturated fatty acids (53 % of total fatty acids), and carbohydrates (113.3 g) with either placebo or 54 mg quercetin. Blood pressure, reactive hyperemia index (RHI), high-sensitive C-reactive protein (hs-CRP), soluble endothelial-derived adhesion molecules, parameters of lipid and glucose metabolism, and markers of antioxidant status were measured before the meal and at 2 and 4 h postprandially. RESULTS: Systolic and diastolic blood pressure increased significantly over time, but were not affected by treatment (placebo or quercetin). During both treatments, serum endothelin-1, intercellular adhesion molecule-1, vascular cell adhesion molecule-1, and plasma asymmetric dimethylarginine slightly decreased over time, whereas RHI increased. Serum triglycerides, total cholesterol, and insulin significantly increased, whereas HDL cholesterol and glucose significantly decreased over time, again with no effect of treatment. Plasma α-tocopherol significantly increased, and plasma Trolox equivalent antioxidative capacity decreased over time. Serum hs-CRP, plasma retinol, and β-carotene did not significantly change during the trial. CONCLUSION: In hypertensive patients, a high-energy meal did not lead to postprandial impairment of vascular endothelial function. Postprandial metabolic responses induced by the challenge, such as lipemia and insulinemia, were not attenuated by the concomitant ingestion of quercetin. This pilot study compared inhibition of the glycaemic response to glucose by a dietary source of quercetin glucosides (onion) in lactose-tolerant adults (n=12) and lactose-intolerant adults (n=12). We hypothesised that lactose-intolerant people (who do not express lactase) will retain intact quercetin glucosides that can inhibit glucose uptake via the glucose transporter SGLT1, whereas lactose-tolerant people (who do express lactase) will hydrolyse quercetin glucosides to free quercetin that does not inhibit glucose uptake. In a glucose tolerance test, reduction in peak glucose levels by an onion meal was higher in lactose-intolerant people than in lactose-tolerant people (44.2 versus 19.3%, P=0.04). Incremental area under the blood glucose curve was reduced more in lactose-intolerant people, but was not statistically significant (54.5 versus 42.1%, P=0.42). A diet containing quercetin glucosides may be of greater benefit for glycaemic control in lactose-intolerant people than in lactose-tolerant people. Integr Cancer Ther. 2016 Jun 28. Consumption of Fresh Yellow Onion Ameliorates Hyperglycemia and Insulin Resistance in Breast Cancer Patients During Doxorubicin-Based Chemotherapy: A Randomized Controlled Clinical Trial. Purpose Doxorubicin has been found to be associated with insulin resistance in animal models. Onion, a so-called functional food, is noted to affect the insulin signaling pathway of diabetes in vitro To our knowledge, this is the first study to investigate the effects of consuming fresh yellow onions on insulin-related indices compared with a low-onion-containing diet among breast cancer (BC) patients treated with doxorubicin. Methods This parallel-design, randomized, triple-blind, controlled clinical trial was conducted on 56 eligible BC patients (aged 30-63 years), diagnosed with invasive ductal carcinoma. 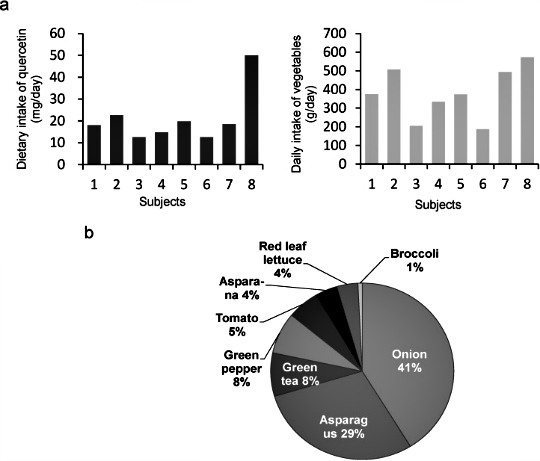 Following their second cycle of chemotherapy, subjects were assigned in a stratified-random allocation to receive body mass index-dependent 100 to 160 g/d of onion as high onion group (HO; n = 28) or 30 to 40 g/d small onions in low onion group (LO; n = 28) for 8 weeks intervention. Participants, care givers, and those who assessed laboratory analyses were blinded to the assignments (IRCT Registry No. : IRCT2012103111335N1). Results The compliance level of participants in the analysis was as high as 87.85%. A total of 23 available cases was analyzed in each group. The daily use of HO resulted in a significant decrease in serum fasting blood glucose and insulin levels in comparison with LO, over the period of study (P < .001). Posttreatment with HO showed a significant decrease in homeostasis model of assessment-insulin resistance relative to changes in the LO group (P < .05). A comparison of the changes that occurred throughout pre- and postdose treatments indicated improved quantitative insulin sensitivity check index (P < .05) and controls on C-peptide in the HO group (P < .05). Conclusions The present study demonstrated the effectiveness of onion to ameliorate hyperglycemia and insulin resistance in BC during doxorubicin-based chemotherapy. J Sci Food Agric. 2016 Nov 12. Evaluation of polyphenolic content and antioxidant activity in two onion varieties grown under organic and conventional production systems. BACKGROUND: Onions contain a number of bioactive compounds – in particular polyphenols. They are a rich source of such compounds in the human diet and offer significant health benefits to the consumer. Demand for organic crops is steadily increasing partly based on the expected health benefits of organic food consumption. The current study examines the influence of organic and conventional crop management practices on bioactive polyphenolic content of onion. RESULTS: We examined the effect of conventional, organic, and mixed cultivation practices on the content of total phenolics, total flavonoids and antioxidant activity in two varieties of onion grown over four years in a split-plot factorial systems comparison trial. Levels of total phenolics and total flavonoids showed a significant year on year variation and were significantly different between organic and conventional production systems. The levels of total phenolics, total flavonoids and antioxidant activity in generally were significantly higher (p < 0.05) under fully organic compared to fully conventional management. CONCLUSION: Organic cultivation practices resulted in significantly higher levels of potential bioactive compounds in onion. Eur J Nutr. 2017 Feb;56(1):343-353. Higher plasma quercetin levels following oral administration of an onion skin extract compared with pure quercetin dihydrate in humans. PURPOSE: To investigate the plasma kinetics of quercetin derived from hard capsules filled with onion skin extract powder or quercetin dihydrate in humans. METHODS: In a randomized, single-blind, diet-controlled crossover study, 12 healthy subjects (six men and six women) aged 21-33 years were administered a single oral supra-nutritional dose of approximately 163 mg quercetin derived from onion skin extract powder (containing 95.3 % of total flavonoids as quercetin aglycone) or quercetin dihydrate (134 mg quercetin aglycone equivalent). Blood samples were collected before and during a 24-h period after quercetin administration. The concentrations of quercetin and its two monomethylated derivatives, isorhamnetin (3′-O-methyl quercetin), and tamarixetin (4′-O-methyl quercetin), were measured using HPLC with fluorescence detection after plasma enzymatic treatment. RESULTS: The systemic availability, determined by comparing the plasma concentration-time curves of quercetin, was 4.8 times higher, and the maximum plasma concentration (C max) was 5.4 times higher after ingestion of the onion skin extract than after ingestion of pure quercetin dihydrate. By contrast, t max did not differ significantly between the two formulations. The C max values for isorhamnetin and tamarixetin were 3.8 and 4.4 times higher, respectively, after administration of onion skin extract than after pure quercetin dihydrate. The plasma kinetics of quercetin were not significantly different in men and women. CONCLUSION: Quercetin aglycone derived from onion skin extract powder is significantly more bioavailable than that from quercetin dihydrate powder filled hard capsules. Summary: Ontario-grown red onions are the most effective at killing colon and breast cancer cells compared to other types of onions, reports a new study. This is because of the onions’ high levels of quercetin and anthocyanin. As part of this project, the researchers are also the first to develop a non-toxic way to extract quercetin from onions making it more suitable for consumption. We carried out a 6-year study to assess the effect of conventional, organic, and mixed cultivation practices on bioactive compounds (flavonoids, anthocyanins) and antioxidant capacity in onion. Total flavonoids, total anthocyanins, individual flavonols, individual anthocyanins, and antioxidant activity were measured in two varieties (‘Hyskin’ and ‘Red Baron’) grown in a long-term split-plot factorial systems comparison trial. This is the first report of repeated measurements of bioactive content over an extensive time period in a single crop type within the same trial. Antioxidant activity (DPPH and FRAP), total flavonol content, and levels of Q 3,4′ D and Q 3 G were higher in both varieties under fully organic compared to fully conventional management. Total flavonoids were higher in ‘Red Baron’ and when onions were grown under organic soil treatment. Differences were primarily due to different soil management practices used in organic agriculture rather than pesticide/ herbicide application. Food Res Int. 2017 Sep;99(Pt 2):851-861. Home cooking and ingredient synergism improve lycopene isomer production in Sofrito. There has been increasing interest in tomato products rich in lycopene Z-isomers since these carotenoids present greater bioavailability and antioxidant capacity than the all-E lycopene form. Intrinsic food properties as well as processing and the interaction between dietary components can all influence the content, type and bioavailability of carotenoids. The aim of this study was to evaluate whether carotenoid content and isomerization in tomato-based Mediterranean sofrito is affected by the process of home cooking and the presence of other ingredients such as extra virgin olive oil, onion and garlic. We used a full factorial design to clarify the contribution of each ingredient to the carotenoid composition of sofrito and to determine whether this can be improved by the cooking time and ingredient synergism. Cooking time and onion content were associated with a higher production of 5-Z-lycopene, 9-Z-lycopene and 13-Z-lycopene in sofrito. Onion proved to be the most interesting ingredient in the sofrito formulation due to their enhancing effect on lycopene isomerization. The use of onion combined with an adequate processing time may improve the bioavailability of lycopene in tomato products.